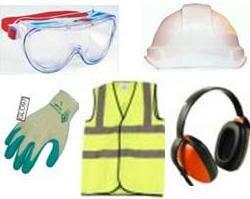 Personal Protective Equipment (PPE) Starter Kit. All of the essential PPE and Safety Equipment in one convenient PPE Kit and at a low low cost - Get your Personal Protective Equipment (PPE) Starter Kits for all your employees today. 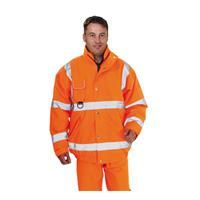 High Visibility (Hi-Vis) Waterproof Over Trousers only £8.50 - high quality waterproof hi-visibility over trousers. EN471 high visibility jackets. 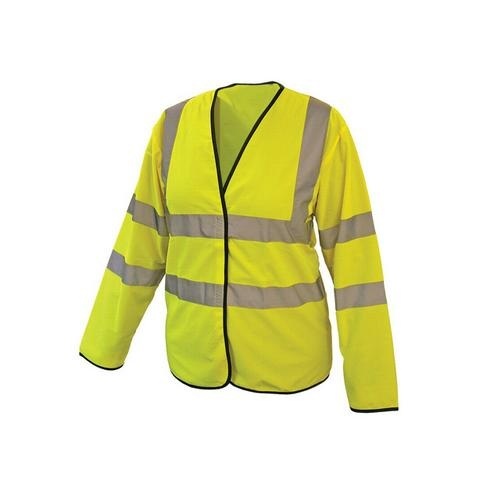 Our Hi-Vis Jackets are the best value hi-vis jackets on the internet, the exceed all of the standards of EN471, they are waterproof, and lined with a warm padded lining. These are for more than just Personal Protective Equipment (PPE) - buy today while stocks last! Polyester breathable, waterproof outer fabric tested to EN 343. Mesh lined. Fleece lined collar with fixed fold away hood. Studded rear vents. Adjustable cuffs. Multi pocketed. Drawcord waist. Reflective tape. Inner jacket reversible fleece. Order yours TODAY! High visibility vests and hi-vis waistcoats. Manufactured in polyester/cotton fabric. Metal zip fly. Shirt grip waistband. Two front patch pockets, two reinforced hip pockets,one with stud fastened flap. Truly bright High Visibility trousers for a stunning £21.95! Order yours NOW! 100% solid knitted Fabric Velcro fastening Black Binding all round Garment, 2 x 5cm wide high visibility strips around Body, one over each shoulder.The ideal choice and at an incredible price of £7.49! 100% solid knitted Fabric Velcro fastening Black Binding all round Garment, 2 x 5cm wide high visibility strips around Body, one over each shoulder. Huge savings on Hi-Vis clothes with SSD! Just £7.70! PU Coated Polyester waterproof breathable fabric with fully taped seams. Heavy duty concealed zip with studded storm flap. Extremley high quality bomber jacket for excessively LOW prices, Only £38.20! PU coated breathable, waterproof outer fabric tested to EN 343. Fully taped seams. Lightweight mesh lining to aid breathablity. Our range of Hi-Vis clothing is one of the most extensive online and we offer some of the most competitive prices! 100% birdseye polyester wicking fabric. Contrast Navy collar. All of our High Visibility range is comprised of the highest quality materials so to ensure long lasting durability and the utmost value for money! PU coated breathable, waterproof outer fabric tested to EN 343. Fully taped seams. Reflective tape. Extremely high visibility trousers for a budget price of only £15.86, order yours NOW! Polyester/cotton, pleatex back. Side and shoulder studs allow for quick removal in case of emergency. Reflective tape. An amazing £12.27! 100% birdseye polyester wicking fabric. Contrast Navy collar. Short sleeve polo shirt that is ideal for those who need comfort and long lasting clothes for work. Manufactured in 100% polyester fabric. Contrast knitted collar and cuffs. Reflective tape. We have a MASSIVE variety of health and safety work-wear, all for exceedingly small prices! Manufactured in 100% polyester fabric. Contrast knitted collar and cuffs. Reflective tape. We have a MASSIVE variety of health and safety work-wear, all for exceedingly small prices! Just £7.72 for this top quality T-Shirt! The Hi Vis EN 471 Reversible Bodywarmer will keep workers, warm, safe and easily seen. The knitted collar makes the neck line comfortable and the padding provides excellent thermal insulating properties. Hard-wearing yet budget priced Hi-Vis safety jacket for just £26.99! PU breathable, waterproof outer fabric tested to EN 343. Concealed zip front, two side pockets with Velcro flaps, stud adjustment at wrist, attached hood. Reflective tape. Transfer coated PU breathable, waterproof outer fabric tested to EN 343. Elasticated waistband. Reflective tape. Offering amazing value for money on Hi-Vis clothing, SSD have all you need to stay well seen and warm and work! PU coated, waterproof outer fabric tested to EN 343. Fully taped seams.100% polyester quilted lining. Embroidery access. Map pocket. Internal pockets. Two lower jetted pockets with flaps. Knitted storm cuffs, concealed zip front with stud fastening. Only £18.72! Zip front. Two side lower welted pockets. Lightly elasticated cuffs and waist hem. Comfort collar. Reflective tape. At SSD we offer some of the best Health and Safety clothing online and all for exceptionally low prices. PU coated waterproof outer fabric tested to EN 343. Fully taped seams. Inside patch pocket. Storm flap. Two outside jetted pockets with flaps. Elasticated storm cuffs, step collar with detachable hood. Reflective tape.